6.4.8 救命胴衣を膨らませるタイミング（航空各社のSafety Video から) - dutcheez’s Fun with English! Inflate the life vest at the door or on the wing by pulling both knobs. Inflate the life vest by pulling down the tab, only at the exit, when you receive instructions from the crew members. Inflate your vest just prior to exiting the aircraft, by pulling down sharply on the red tab. Once outside, pull down on the red tab to inflate the vest. 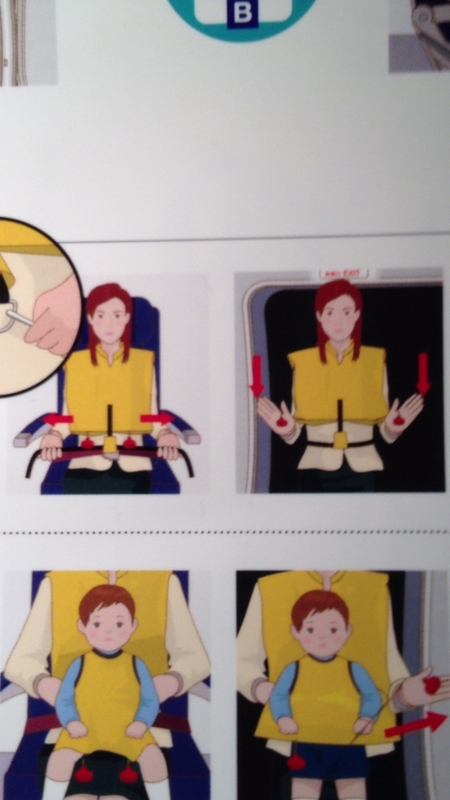 … Never inflate the vest inside the airplane. As you leave the plane, inflate the vest by pulling down on the red tabs at the bottom of the vest. Once off the plane, pull the handles and your vest will inflate.